KIM KNOTT is a multi-titled superstar of bodybuilding and fitness. 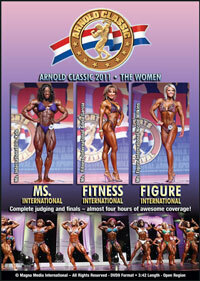 She has won national and international titles in bodybuilding, fitness and aerobics. As a talented all-round athlete, Kim has also won titles in other, non-fitness, sports such as water-skiing. Her latest success was the title of the INBA Overall Miss Olympia and INBA Miss Olympia Professional champion. We showcase her gym training and career highlights from her first National Bodybuilding Title in 1988 through to the present day. This is not just another workout video but a visually exciting DVD journey through a lifetime of fitness. Includes outdoor posing in Adelaide, South Australia, in various outfits, plus her latest show routine with her display team. Throughout the video Kim's condition is absolutely awesome - no-one can touch her for muscularity, vascularity and her paper thin skin- she's never ever out of shape. Much of this tape was shot with 2 cameras, and this DVD also includes a photo gallery.